By default, transactions in EJBs are automatically managed by the container. This means that you normally don't need to do anything if you want your application to be "transactional". Every EJB that you have created so far has used transactions. When you used JPA, the EntityManager would automatically save all of its changes on transaction commit (i.e., when your method returns). Java EE allows you to override the default transaction behavior. For this activity, you will explore what happens when methods with different "TransactionAttributeType"s interact with each other. What happens when a method with TransactionAttributeType.REQUIRED calls a method with TransactionAttributeType.NEVER? What happens when a method with TransactionAttributetype.NOT_SUPPORTED calls a method with TransactionAttributeType.MANDATORY? Your challenge is to write some Java code to help you answer these questions. You should create a new project. Name the project Week11. You can use a Web Application or an Enterprise Application. Ensure that you use the JavaServer Faces library if you are using a Web Application, or add JavaServer Faces to the Week11-war project. Another @Stateless EJB (named SecondaryBean) that is injected into the first EJB (e.g., @EJB private SecondaryBean secondaryBean;). You would then write a method in your first EJB (TransactionBean) that calls a method in the second EJB (SecondaryBean) that has been annotated with a different transaction type. Be careful: transaction attributes only work when you call an injected EJB. If you just call another method in the same class directly, the container does not create a new transaction scope. i.e., In the following class, if you call a(), the MANDATORY transaction type is used even when b() is called. To get the container to use the other transaction type, you would need to move the method b() into a separate EJB. In what situations would you use MANDATORY? In what situations would you use SUPPORTS? In what situations would you use NOT_SUPPORTED? Why is the transaction attribute ignored when you do a direct method invocation? In this exercise, you will explore transaction isolation. You will perform different actions on separate threads. That is, you will have multiple transactions running at the same time, and you will see how they interact. Under different transaction isolation levels, you should observe different behaviors and different performance characteristics. This activity requires that you have set up "jdbc/aip" in JNDI as a JDBC resource that connects to a JavaDB (Derby) database. Refer to the Week 5 lab exercises for instructions on creating a Java DB database, setting up the AIPPool JDBC Connection Pool and the jdbc/aip JDBC Resource. Create a new @Stateless session bean (EJB) named TransactionIsolationBean in the appropriate package of your project. * Uses JDBC to read the current value from the integer_store table. * Uses JDBC to update the current value in the integer_store table. * Set the initial value of the integer_store to be 0. * 500 milliseconds. Reports the progress to the system log. *   The first parameter is a prefix used in log files. *   The "rr w" is the list of operations. Each character represents an operation. *   "r" represents a read, "w" represents a write and any other letter does nothing. *   The third parameter means that any write operation will write the number 1. * not try to "catch" up with lost time by avoiding the waiting. If you look at this code, you may notice that the run(...) method has an @Asynchronous annotation. This tells Java EE that when the method is called, it should be executed in a new thread. In addition, Java EE will start a new transaction for that separate thread. That is, each time you call run(...), GlassFish will launch a separate transaction that runs separately and concurrently. You will learn more about @Asynchronous in next weeks' lectures. TransactionIsolationBean could be used directly. However, for this exercise you can call it from a separate EJB. Now, add a h:commandButton to your JSF view and an action (i.e., a method) to your JSF backing bean. The action in your backing bean should simply call isolationTest on your TransactionIsolationBean. Do you understand what the run(...) method does? Run the application. 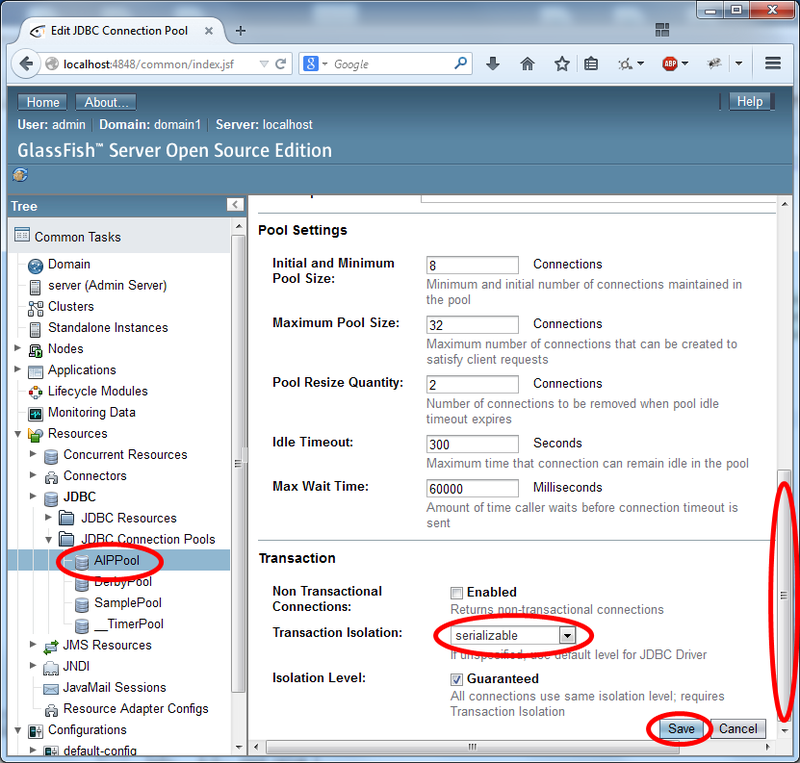 If you look at the GlassFish log, you will see the output of the 5 separate transactions. It may take a while to complete because each operation has a 500ms pause. In addition, is is possible that the transactions encounter a deadlock situation which takes up to 20 seconds for JavaDB to detect. 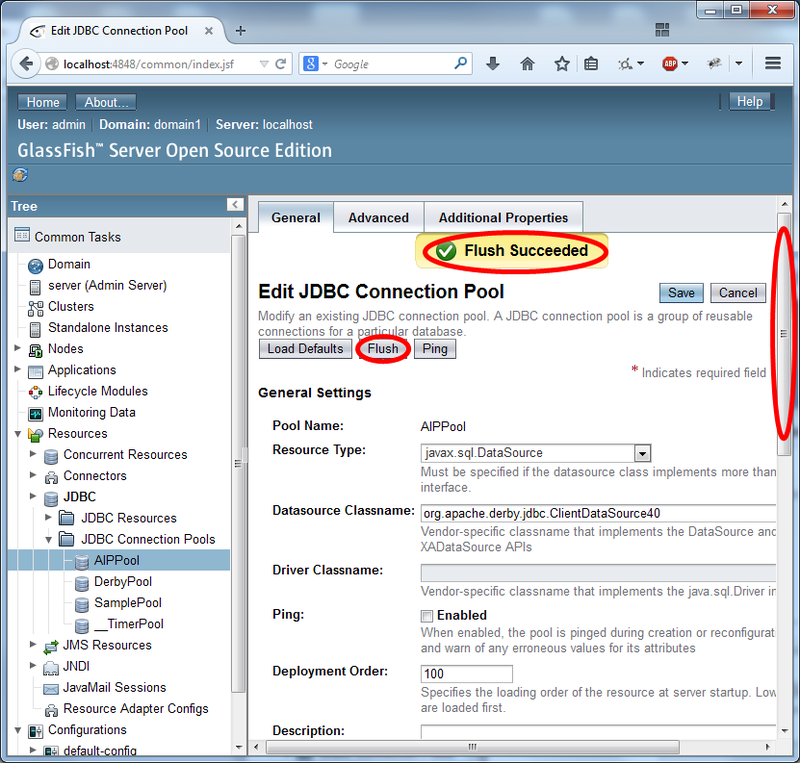 Launch the GlassFish Administration Console, and locate the settings for your JDBC Connection Pool. Scroll down to the bottom of the settings and change the Transaction Isolation level to "serializable" and click Save. Now, scroll back up to the top of the page and click Flush. This will ensure that any pooled connections with different transaction isolation levels are "flushed out". Use your JavaServer Faces application to run the isolationTest code again (note that you do NOT need to redeploy, you can simply continue with the same running application). Now that you are able to change the transaction isolation levels, run your isolationTest method under each of the four isolation levels provided. (Remember that each time you change the isolation level, you need to Save and then Flush). You can copy-and-paste the output to a separate text file to make it easier to compare the isolation level. Which isolation level was fastest? Which was slowest? Was the output the same for any isolation levels? Why? Can you identify any "dirty reads" or "unrepeatable reads" in the GlassFish output logs? Why might you want to change the transaction isolation level? What are the advantages and disadvantages of doing so? Does the timing information provide you with any clues about how Java DB enforces transaction isolation? Click here to download a WAR file that contains a social network application. The application requires a JDBC resource named "jdbc/aip" (without the quotes). If you do not already have it set up, refer to the Week 5 lab exercises. It will automatically connect to jdbc/aip and create a database when it is deployed. 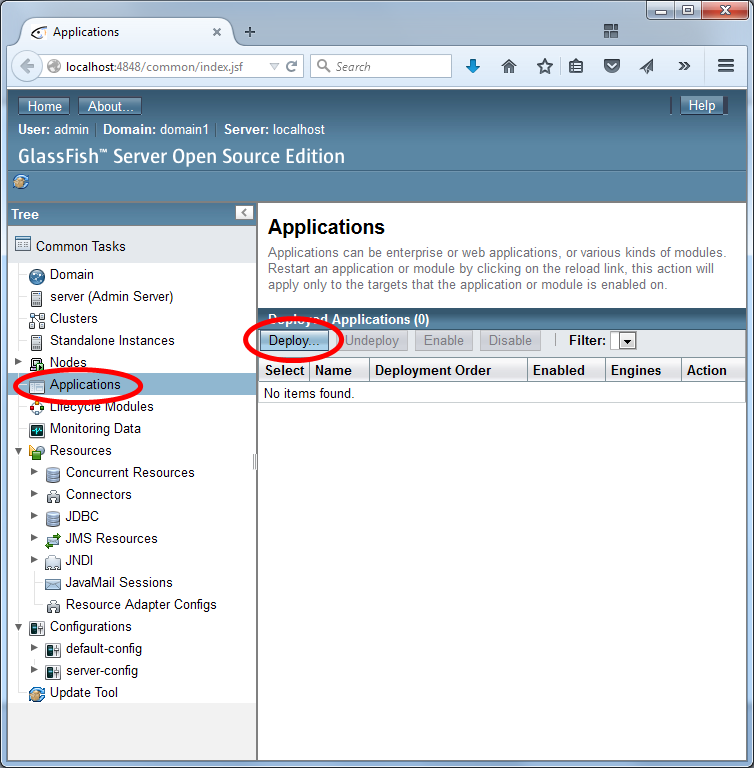 You can deploy it by launching the GlassFish Administration Console. IMPORTANT: First, check that you have a JDBC Resource named jdbc/aip. If you do not have the resource, deployment will fail. 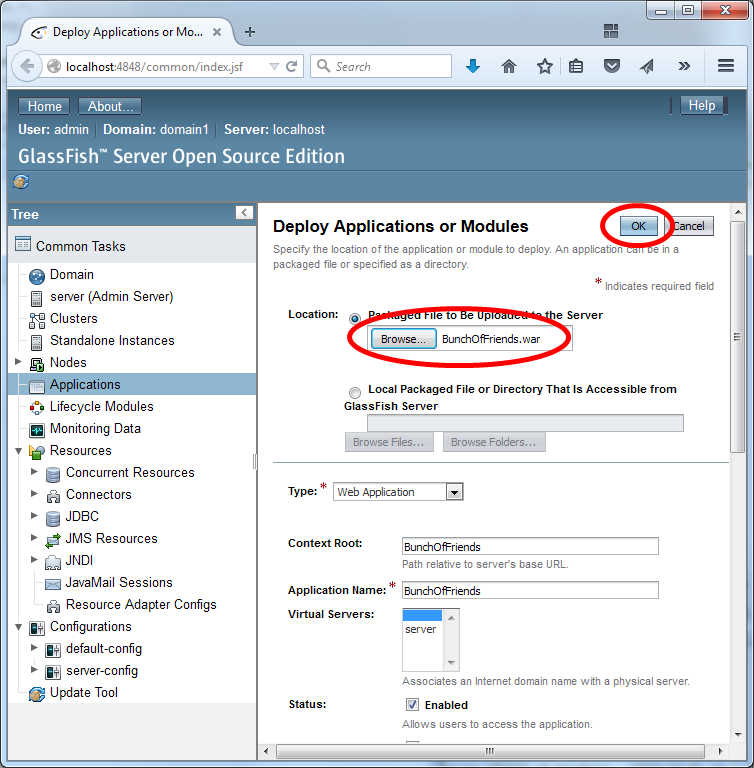 If deployment fails, you will need to set up jdbc/aip properly, undeploy the existing application, restart GlassFish and deploy it again. Click on applications, and select deploy. Then browse for the WAR file as depicted in the image below, and select OK. This application suffers from many of the OWASP Top 10 vulnerabilities. Your task is to test the application for the vulnerabilities. It is important to understand these vulnerabilities to protect your own applications. However, you should not exploit vulnerabilities in other systems without permission. Unauthorized access to a system is unethical, illegal and unprofessional. As part of the challenge, you might also consider unzipping the WAR file or manually browsing the jdbc/aip database to get clues. How many of the following vulnerabilities can you demonstrate exist in the application? The application is vulnerable to SQL injection. You can use SQL injection to log in without a valid password. The application is vulnerable. You can experience this directly by disabling cookies in your browser. Java will use URL rewriting to track your session in the URL. Can you think of a way to "hijack" a session of another user (hint: you might use XSS). The application is vulnerable. Many inputs/outputs in the application are not sanitized or escaped. The application is vulnerable. See if you can view the posts of somebody who is not a friend, without "friending" them. The application is vulnerable. Pages aren't properly secured. See if you can view the posts of a user, without logging in. The application is vulnerable. The database stores passwords in plain-text. See if you can identify the username/passwords by using a direct SQL connection to the database from within the NetBeans services tab. The application does not have privileged users so this is not applicable. The application is vulnerable. See if you can create a website (using another project) that will automatically cause logged in users to add a friend. To my knowledge, the application is not vulnerable to this problem. The application does use a redirect. However, I don't think the redirect can be exploited. Can you identify any broad principles that might help prevent many of these problems? Is it ethical to test public websites for vulnerabilities?